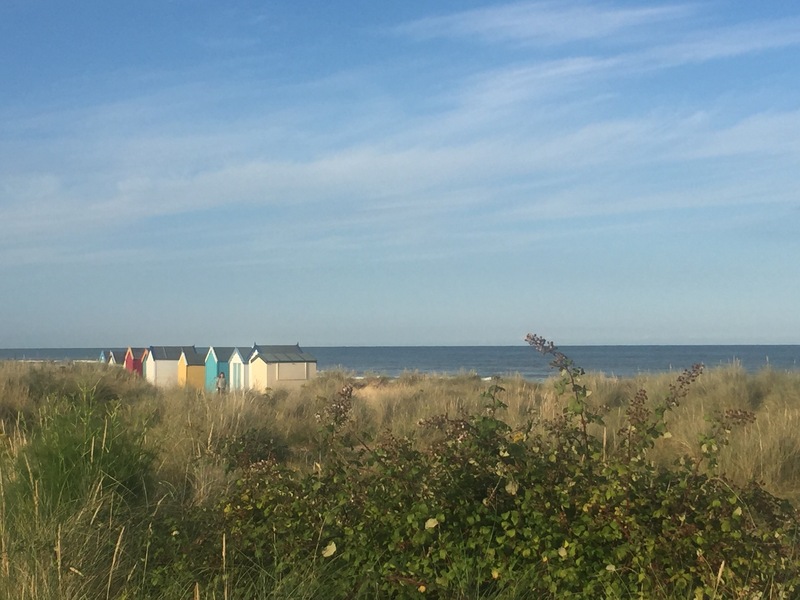 Unless you are completely new to this blog, it won’t have gone unnoticed that we are currently on our summer holidays at Southwold in Suffolk. 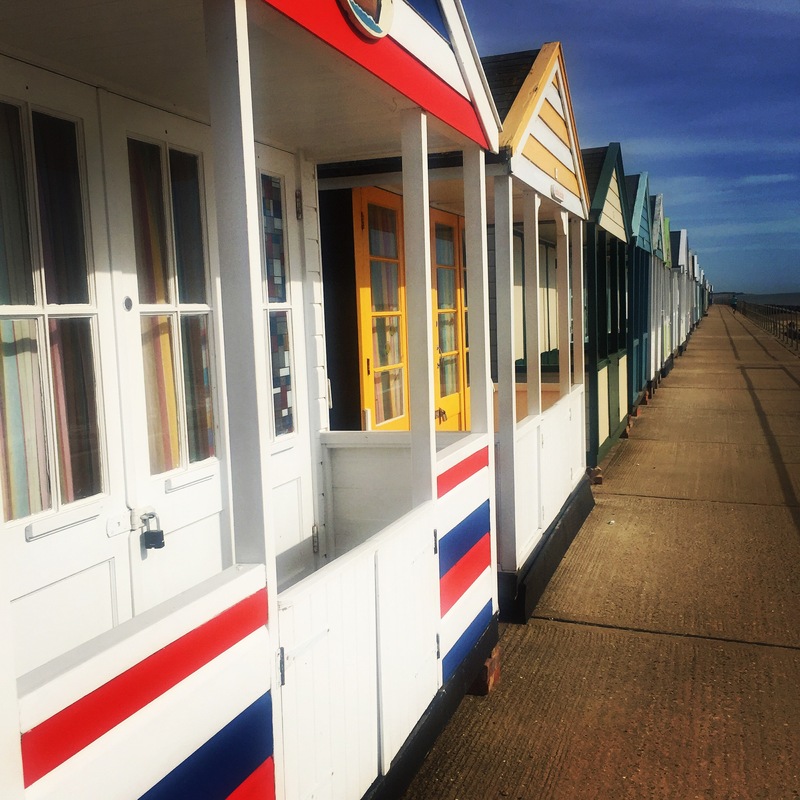 It’s a beautiful English seaside town which has loads of charm and character. 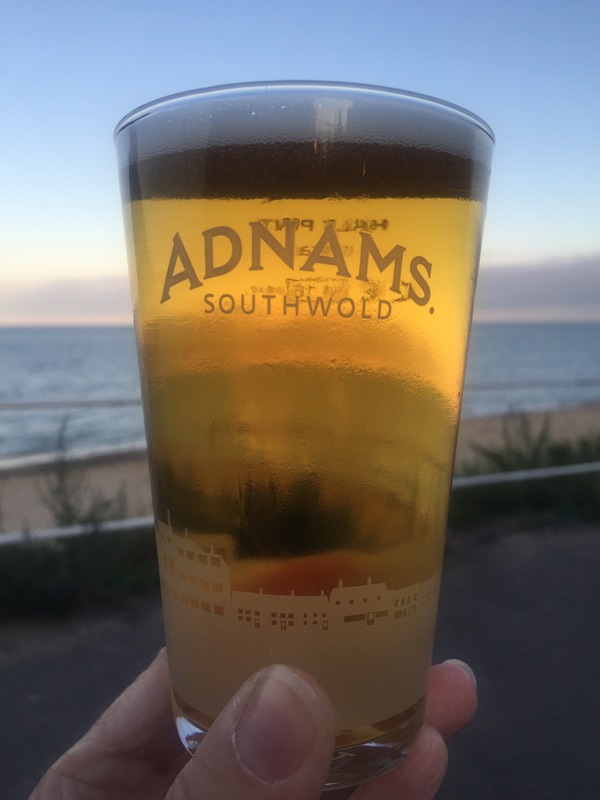 It’s famous for its beach huts, lighthouse, beach and pier as well as the Adnams beer which is brewed locally. 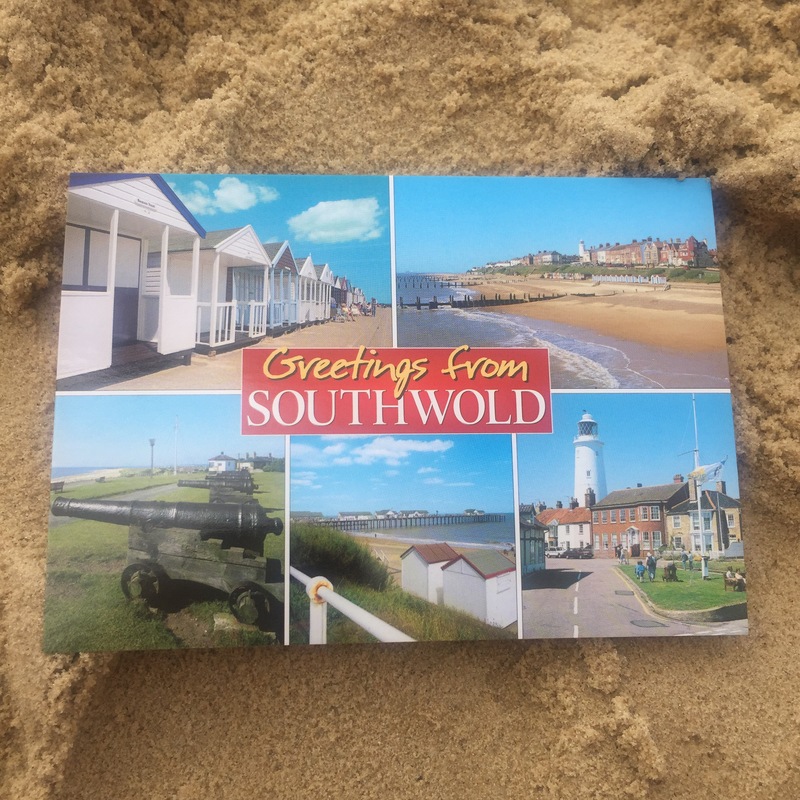 Mr Postcard grew up quite nearby, so Southwold has been a regular venue for day trips for us many times over the years while in Norfolk and Suffolk visiting his family. 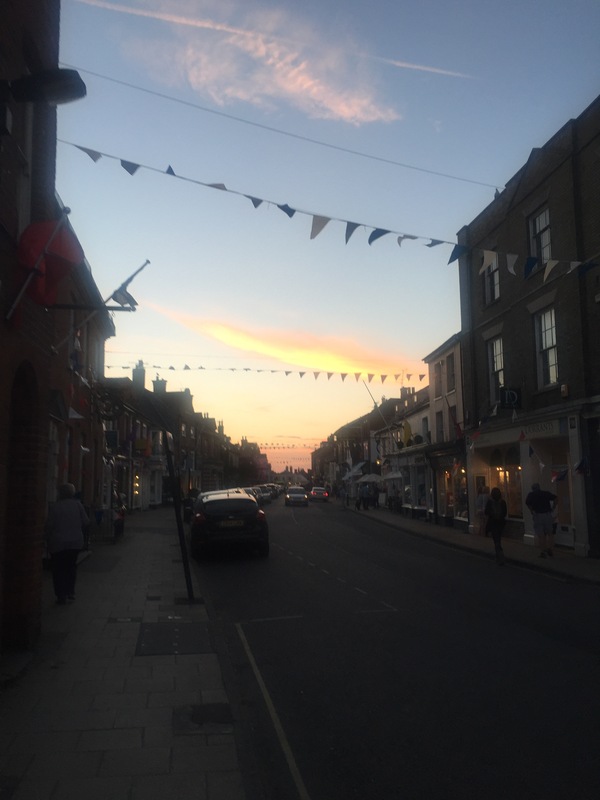 This time, however, is the first time we’ve actually stayed in the town. I thought we had probably seen all that it has to offer in the 20+ years we’ve been coming but I was wrong, one and a half weeks into our stay we are still finding quaint alleyways and new places we have never seen before. Would you like to join me for a look around? The little museum seems like as good a place as any to start… Manned by volunteers and open for just two hours a day it holds all sorts of relics from the towns past. 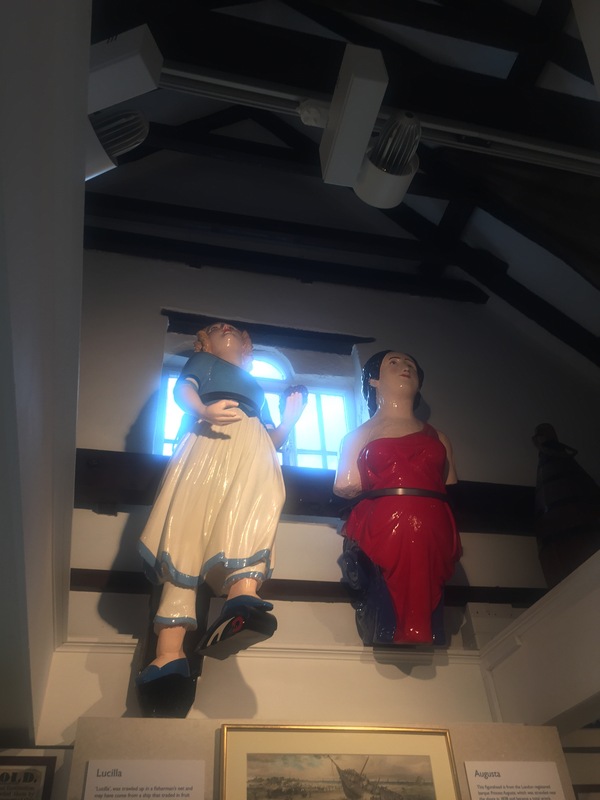 From figureheads from boats to fossils and mammoth teeth. 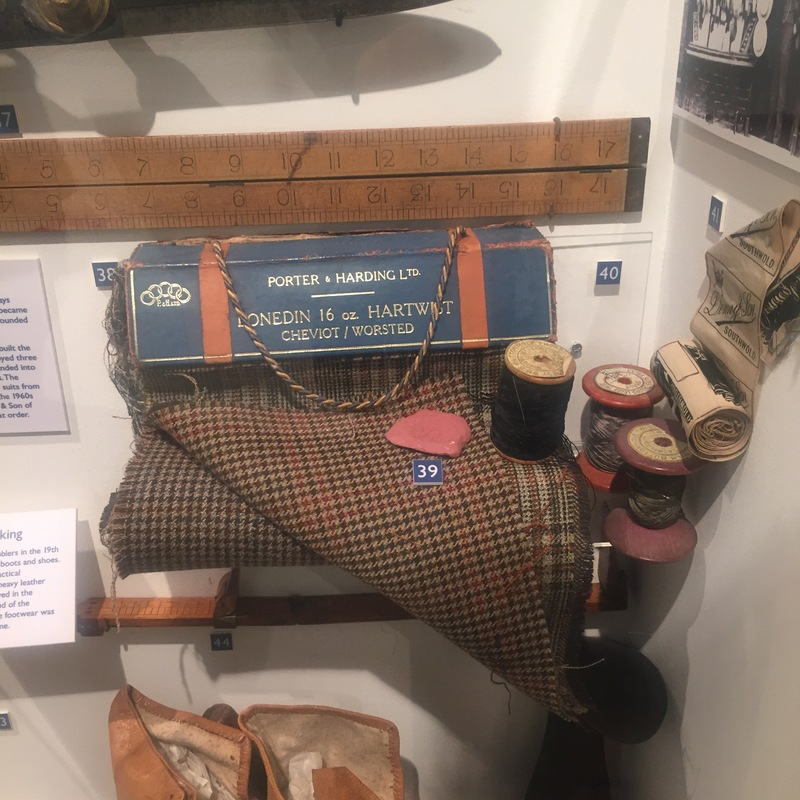 It has all sorts of bits and bobs relating to the town’s past, this little display was connected to the town’s tailor which is still operating as a clothes shop known as Denny’s. Whether they’ll make you a three piece suit out of tweed in this day and age, I’m not sure. 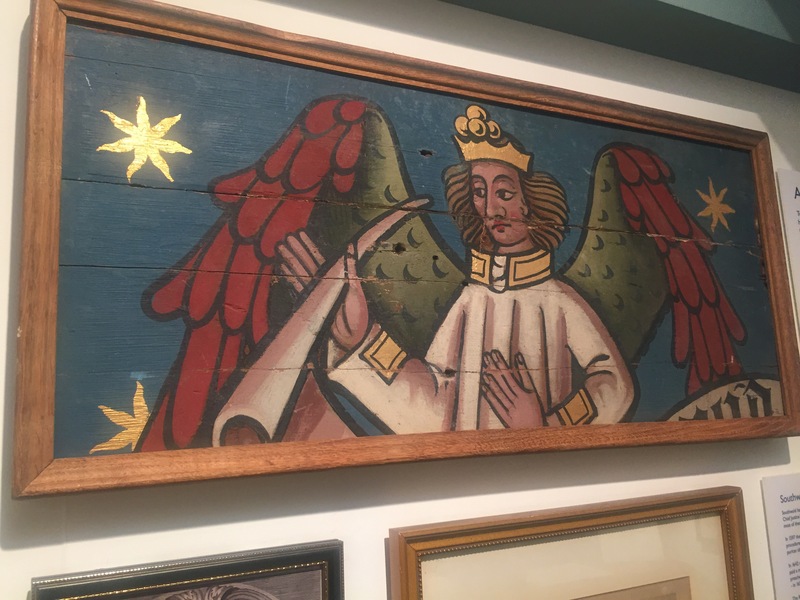 There were also lots of items relating to the religious life of the town with fragments of stained glass windows from the church of St Edmund’s which was close to a direct hit by German bombs during World War II. 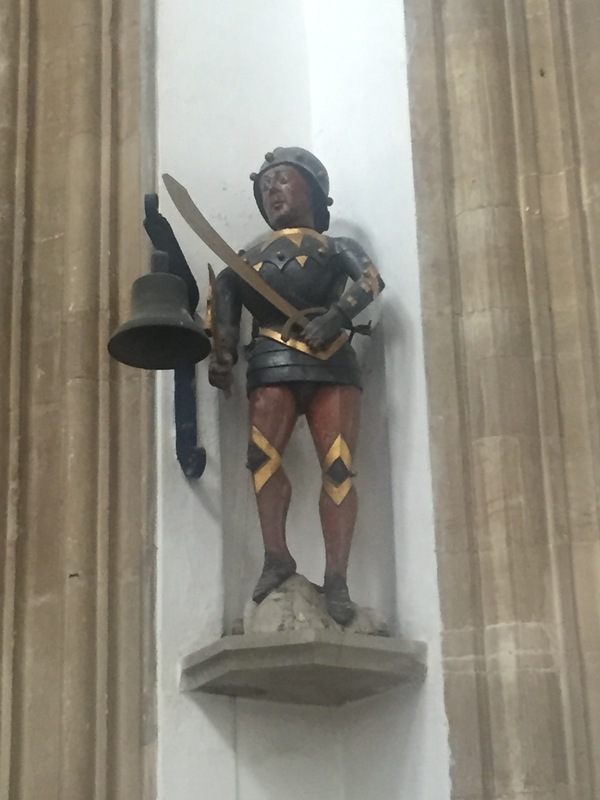 The church is home to Southwold Jack, a figure who strikes a bell with his sword. He was once part of a clock and chimed the time. 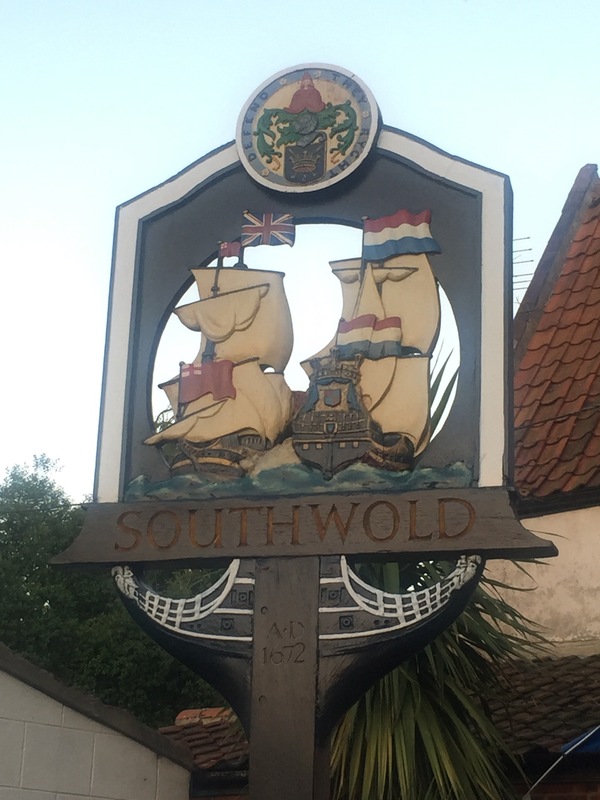 He is an emblem for Southwold and even appears on the bottles of beer produced in the town. And in all the pews. 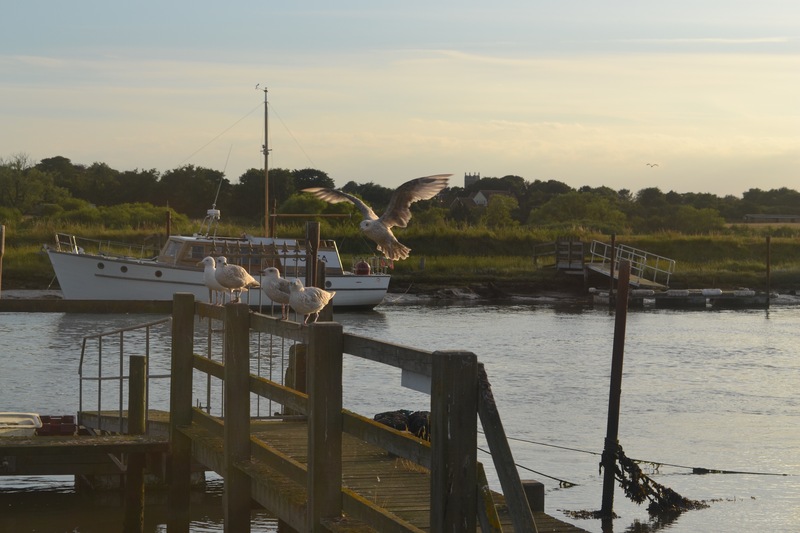 Beside Southwold lies the River Blyth which offers the town a natural harbour. 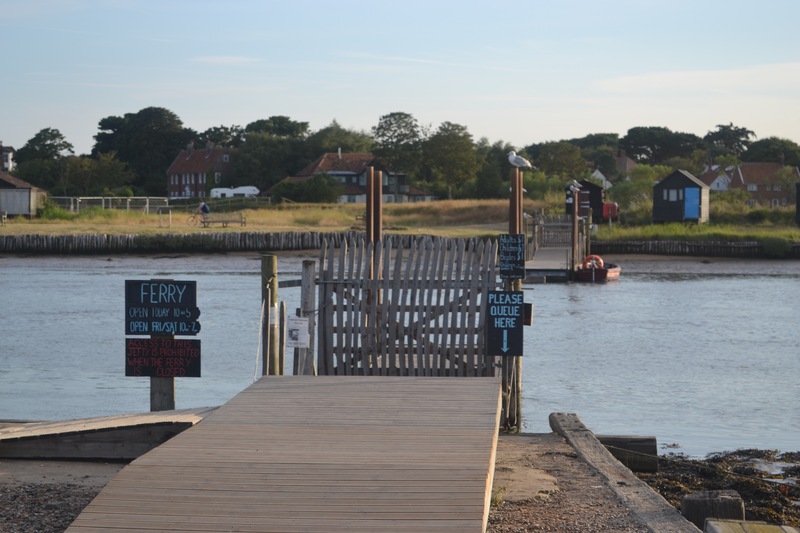 Here you can catch a ferry (rowing boat) across to the picturesque village of Walberswick on the other side. It’s a really beautiful spot. We took a walk along the riverside on evening on a quest to find somewhere to have dinner. We were lucky enough to see a seal swimming in the harbour. 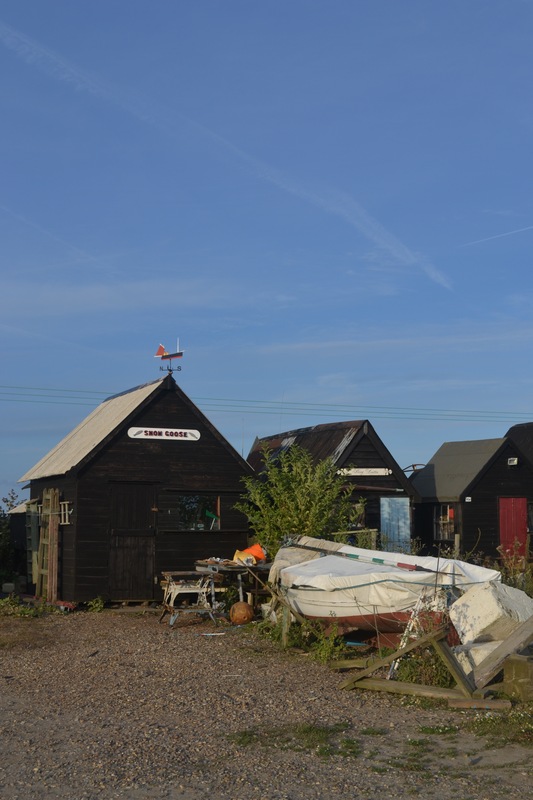 Along the riverside lie many black huts belonging to the fishermen who work these waters. 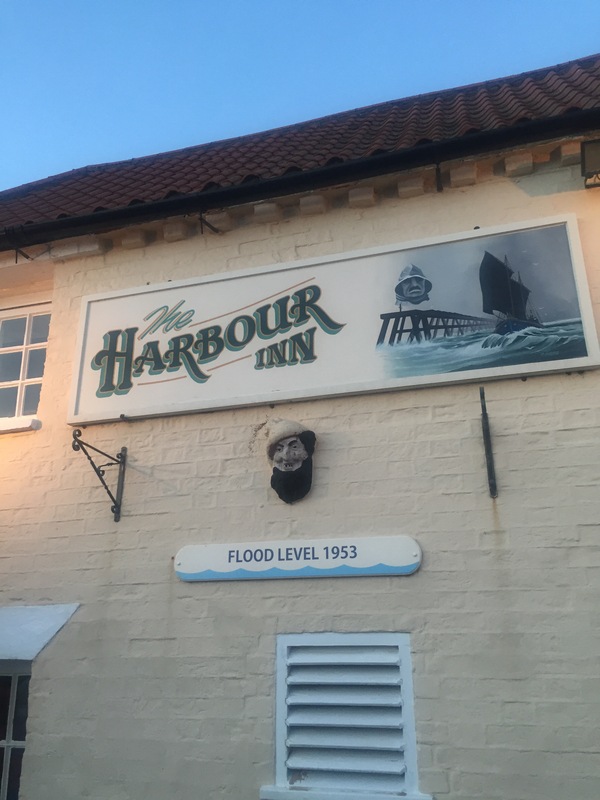 After a very pleasant walk we found ourselves at the Harbour Inn and enjoyed a lovely meal outside with the Little Postcards as the sun went down. 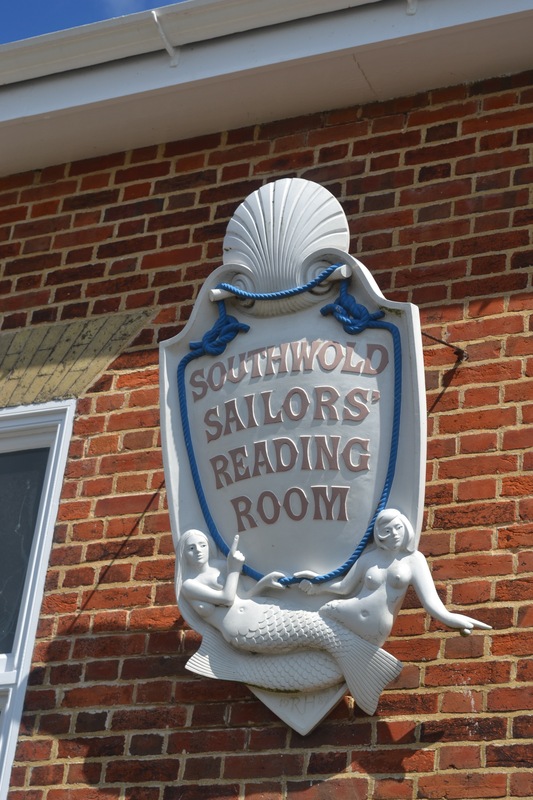 The Southwold Sailors’ Reading Room is a really special place. 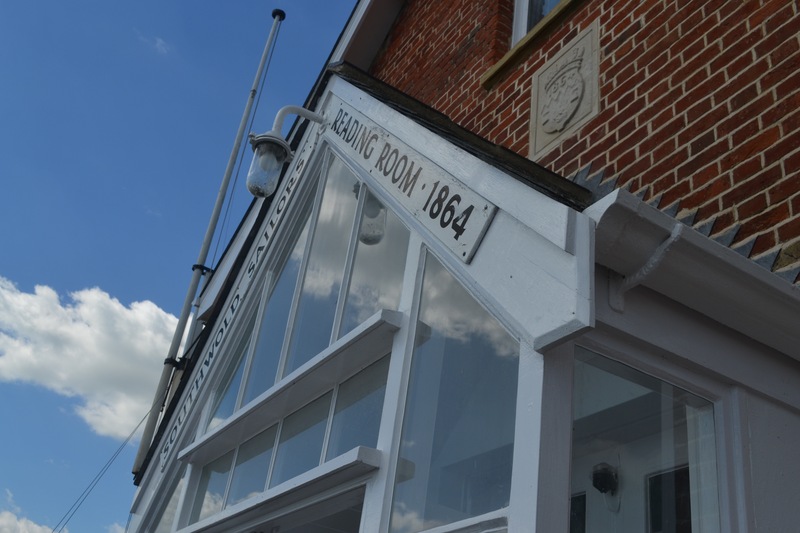 It’s a kind of club for sailors but it’s open to the public to visit for free. 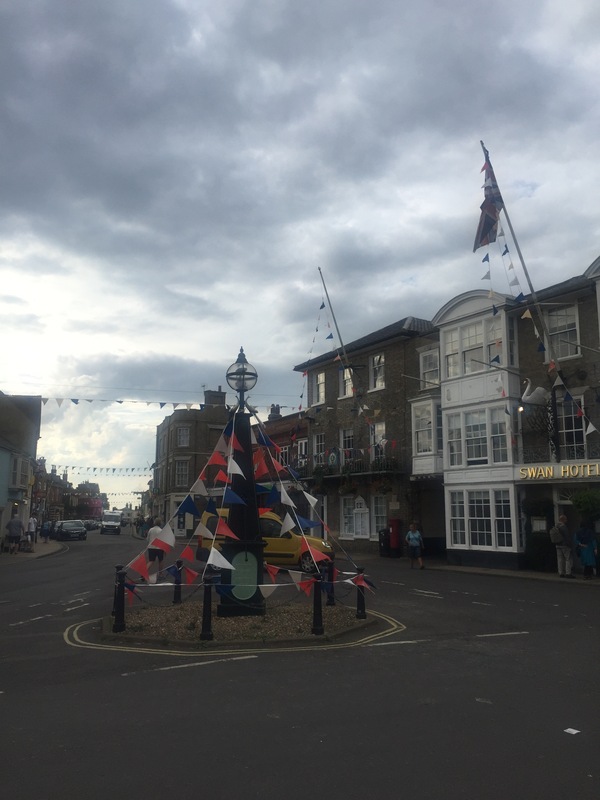 It’s filled with photographs of sailors from years gone by and photos, paintings and models of their boats too. 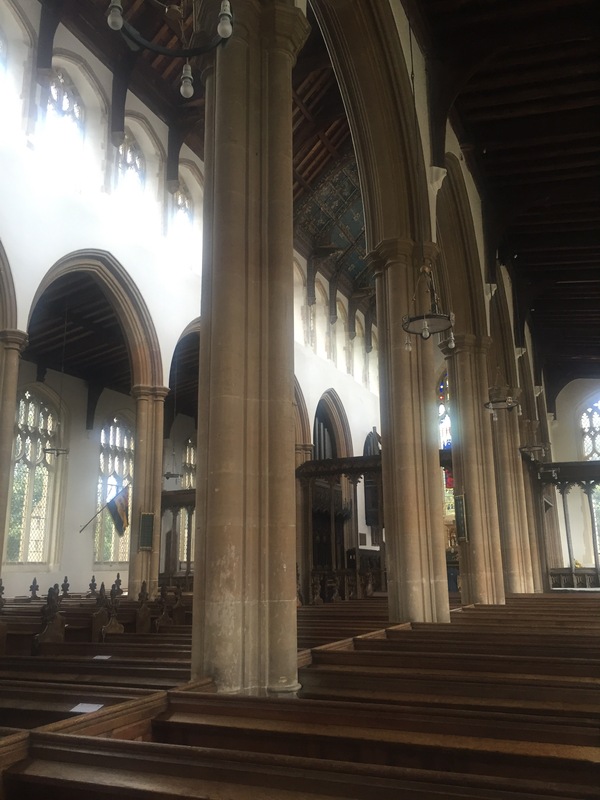 Cameras are not permitted inside, so I can’t show you the interior but it really is worth a visit. 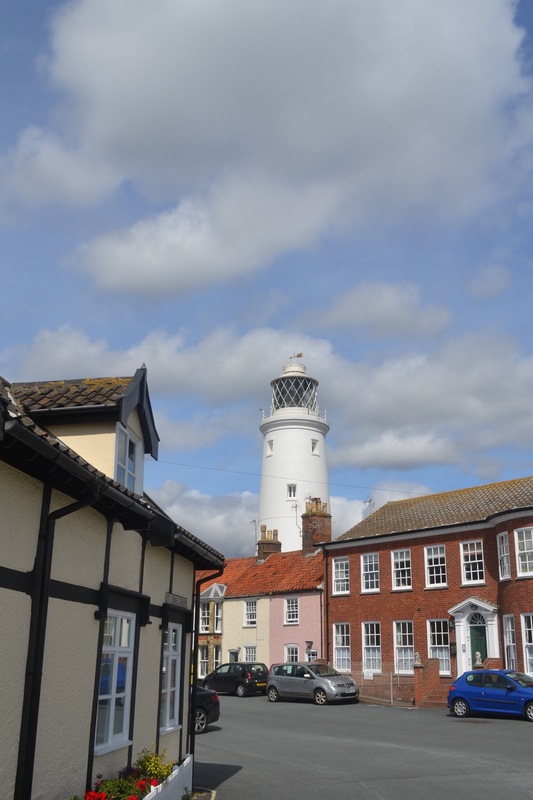 The town is dominated by the Trinity Lighthouse. 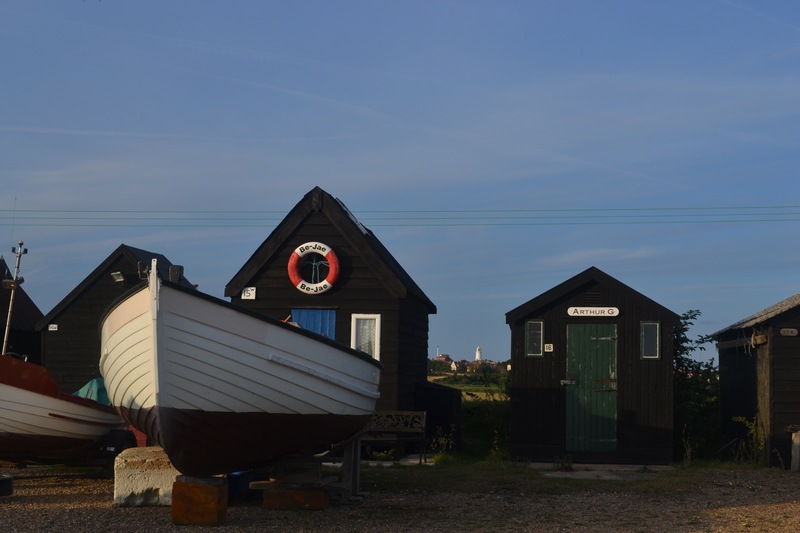 Nestled in amongst the terraced cottages and next to a pub, it’s open for visitors to climb the many steps to the top to look out across the sea and coastline. 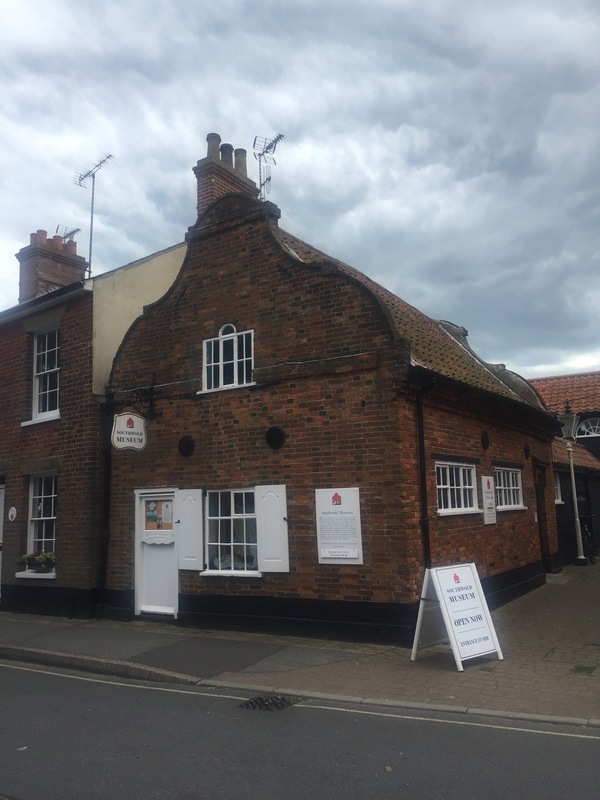 The RNLI has a strong presence in Southwold. 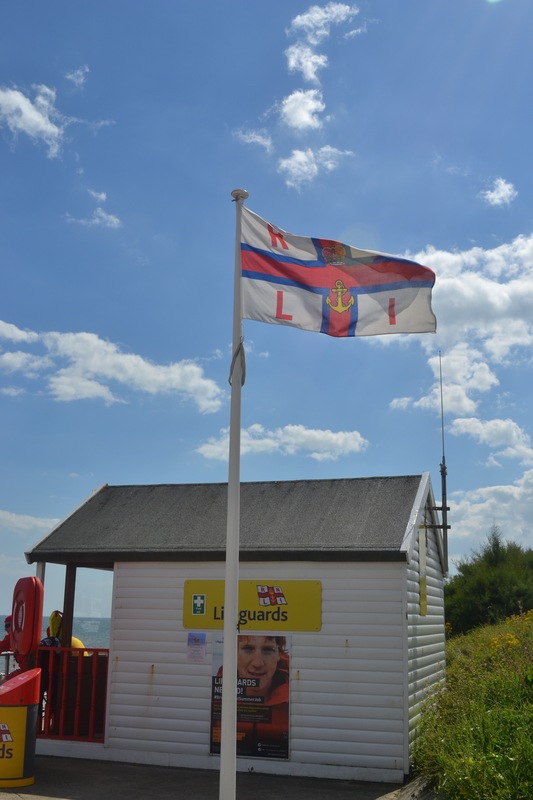 In summertime there’s a lifeguard station and all year round there’s a lifeboat station, manned as always by brave volunteers. There’s even a museum dedicated to the great work these amazing people do and have done over the many years they’ve been on duty here. 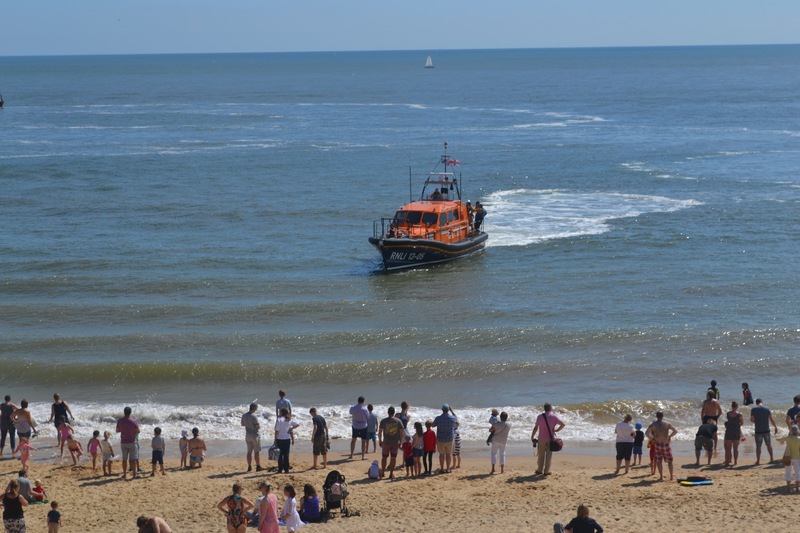 On our first day here, we were lucky enough to see a display by the local lifeboat and the larger lifeboat (below) from nearby Lowestoft. As you can see, hundreds of people turned out to see the event from the cliffs and the beach as the lifeboat crews staged rescues of surfers, a fishing boat crew and swimmers. 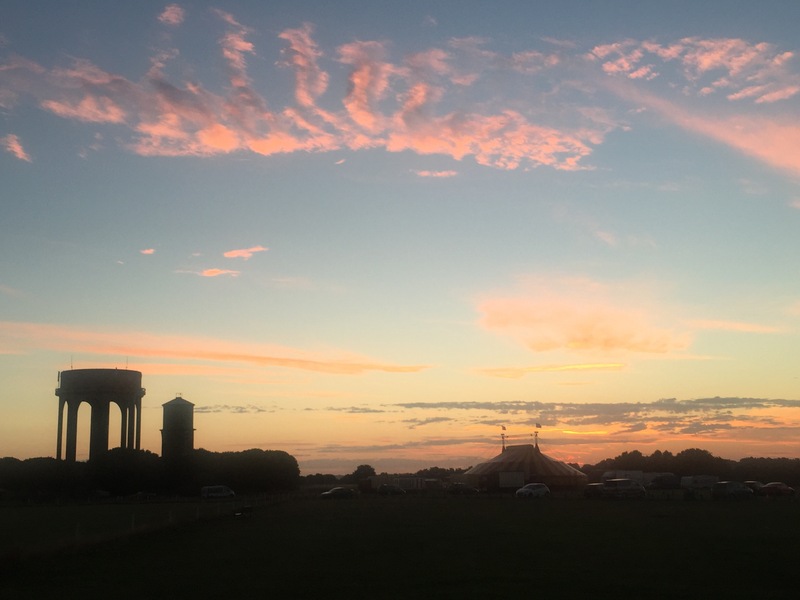 Behind the town lies the common complete with it’s two striking water towers, and also currently, the circus. 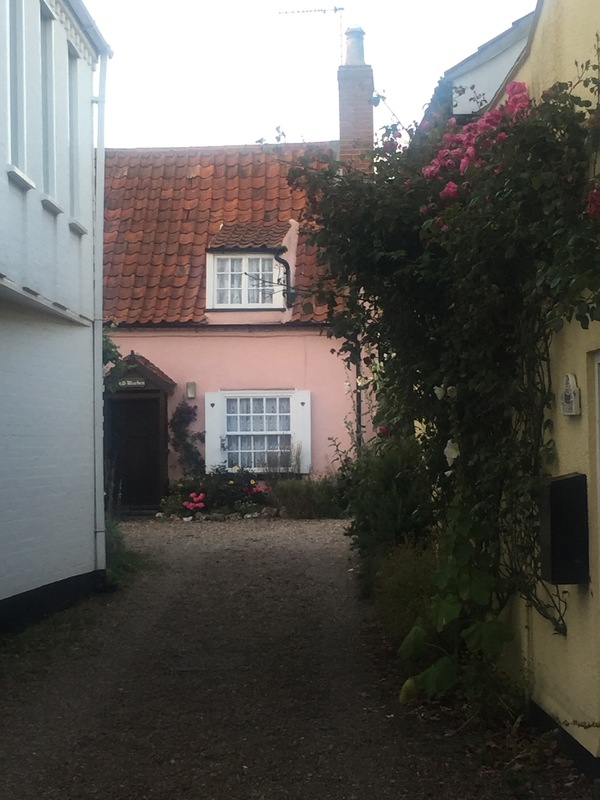 There are so many beautiful buildings lying up alleyways and tucked away off the beaten track. 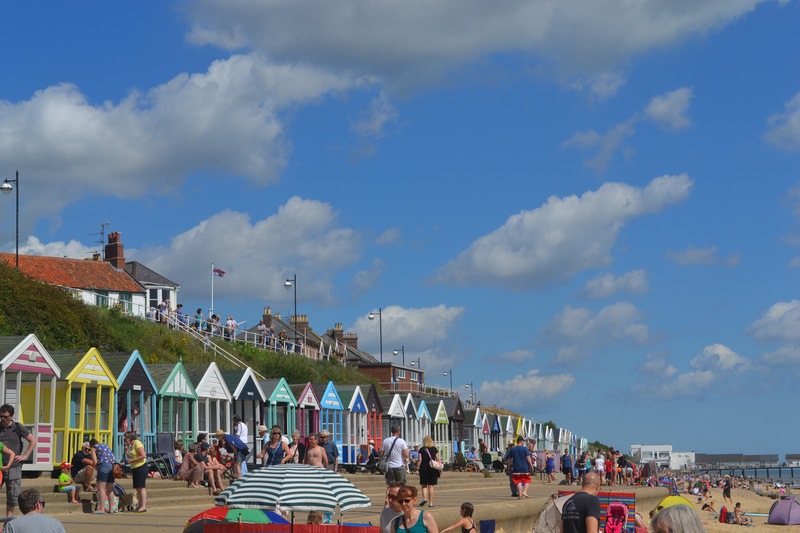 I love southwold! It’s such a lovely laid back place to have a summer holiday. We went across in the ‘ferry’ to the little village too when we were there a few years ago. 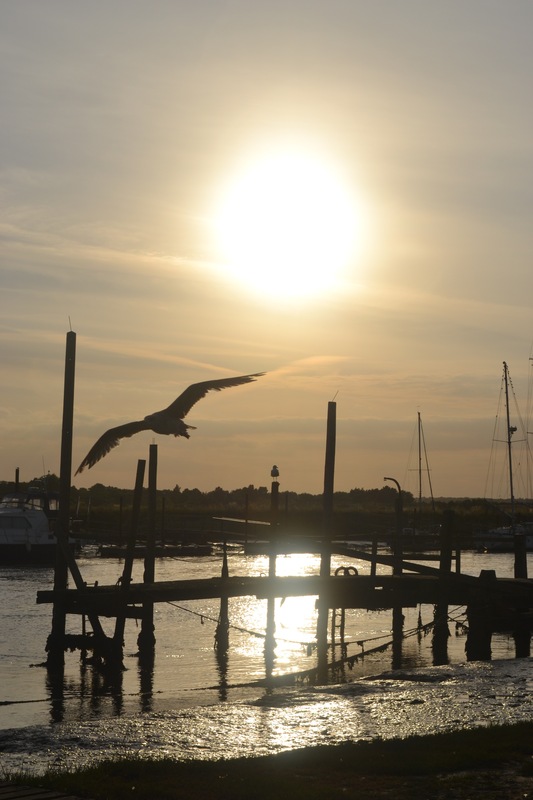 I think maybe fish and chips in the restaurant on the pier was my fav! Gorgeous photographs. Especially love your evening pictures. 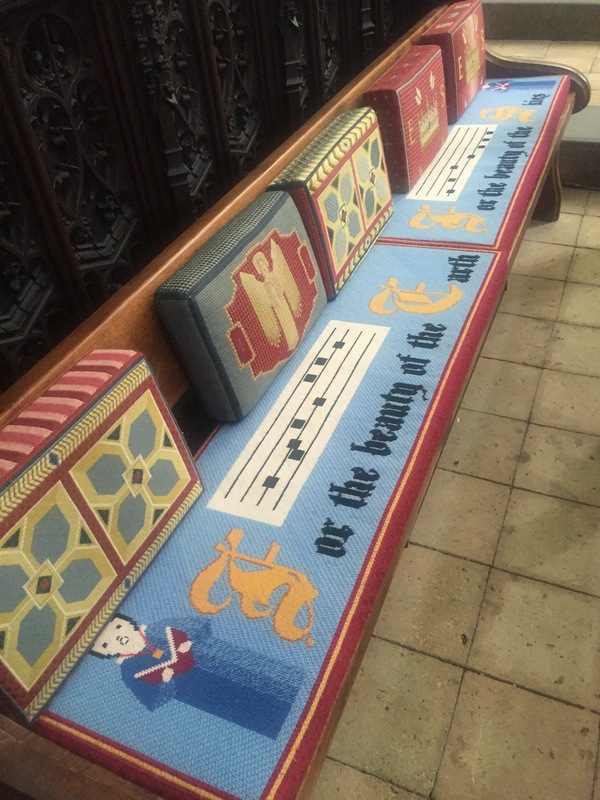 Love the kneeler with the beach huts in the church. Thanks for taking us along. It’s such a gorgeous place, the photos kind of take themselves 😊 I’m pleased you enjoyed the trip! I’m afraid your blog may be broken. Can’t get into it on explorer anymore – have to use firefox. Also I go to blogs from other people’s blog rolls sometimes. Go and check out Bunny mummy blog. 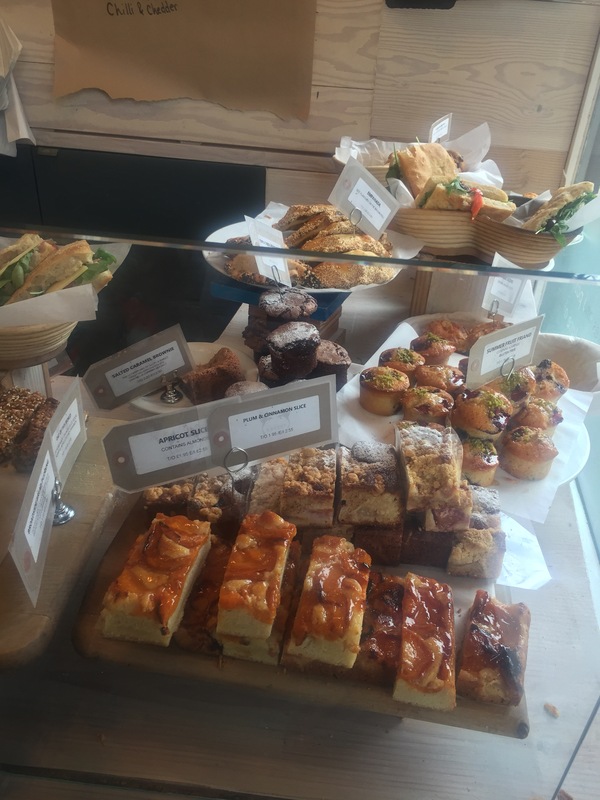 Her blog roll is absolutely swamped by the photo from your blog which elongates over most of the screen at the side. It’s awful! It has been doing it for several weeks. It didn’t used to do this and is unique to your blog. Your blog can’t be accessed from the blog roll either. Of course it may be my computer but it is very strange to have it just with your blog. Oh dear 😦 I’m sorry to hear that. I’m away from my laptop at the moment but I’ll check it out when I get back home. Thanks for letting me know. Looks amazing. I want to go!! 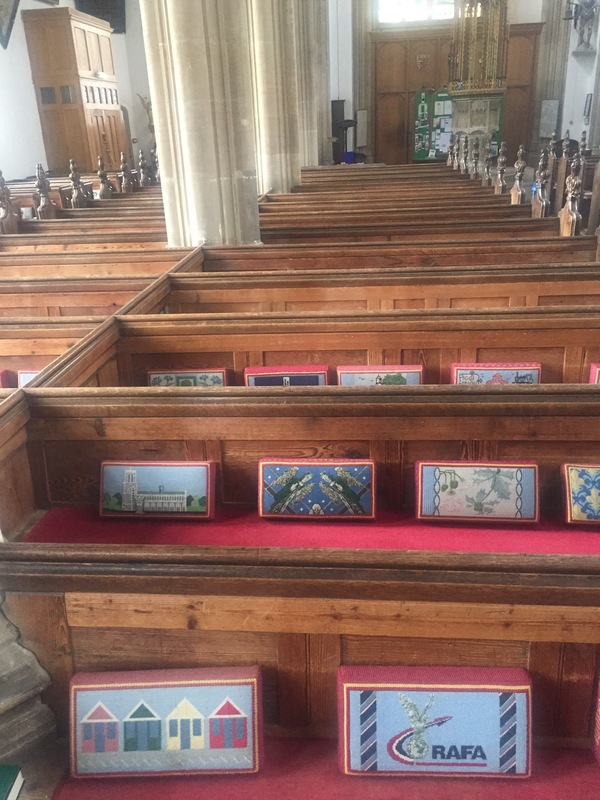 That church is spoiled with all that stunning needlework, how lucky to have such works of art. 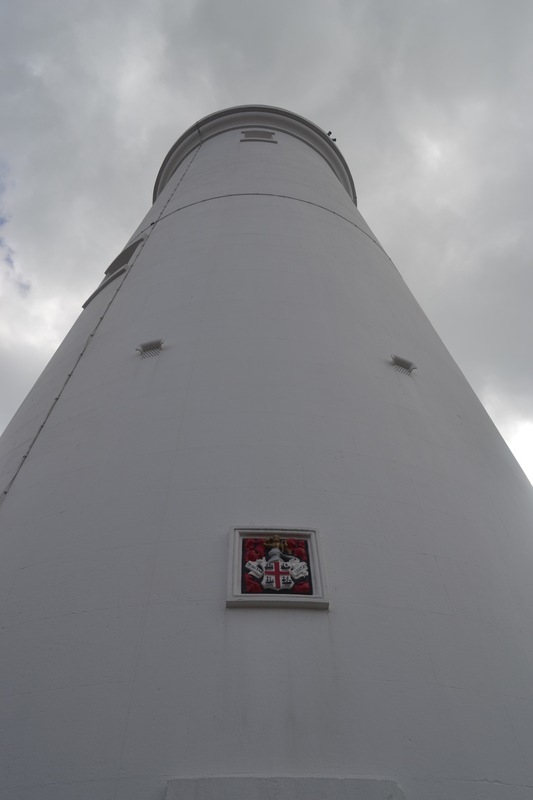 Bet you ran up the lighthouse steps in no time, what with all your Med Steps training! What an interesting place. 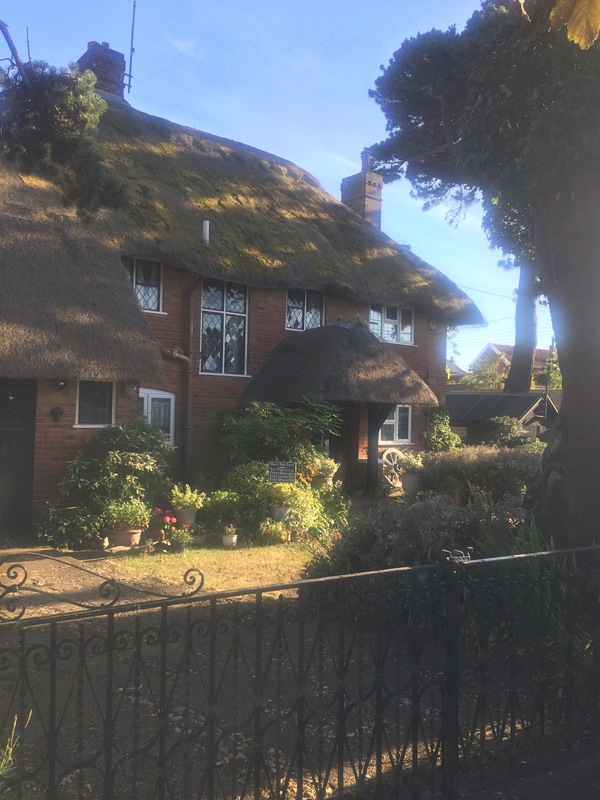 I don’t know that part of England very well at all but it looks lovely. 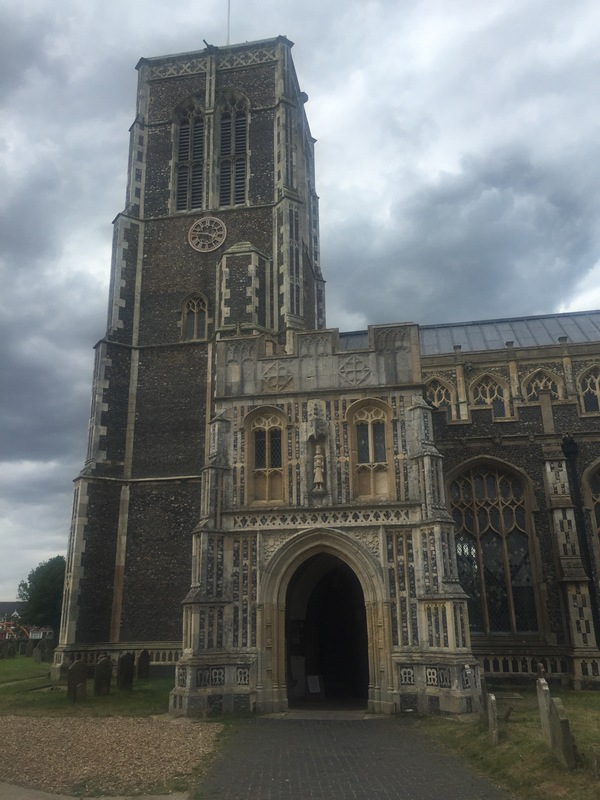 It is – there’s so much to do and see here!